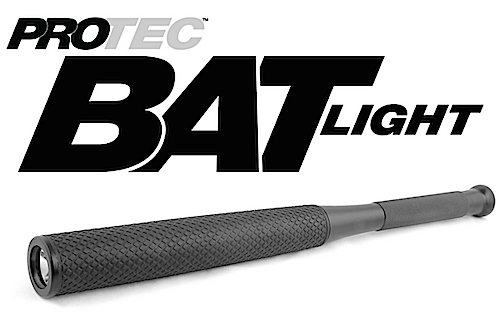 I’ve owned a Nebo Protec Bat Light for over six months as of the writing of this review. I also purchased a unit for my wife, so the review will include some observations from her usage over the same time frame. Just in case you are not familiar with the product, the Bat Light is not a flashlight that attaches to a famous super-hero’s utility belt. It is a 16”, 200 LM LED flash light in the shape of a miniature baseball bat. The frame is anodized aluminum with a rubberized protective sleeve and textured hand grip. The product is made by the iProtec division of NEBO Tools, a company that is no stranger to lighting products. Actual dimensions are 16.25” x 1.25” at the light end of the bat. Weight is under half a pound. The light has three modes, low, high, and strobe. I tend to leave mine on high as I find moving through the modes a bit cumbersome. In any defensive situation, I like to bring a light to bear, press one easy-to-reach switch, and have it come on in the same mode time after time. In addition to ease of operation, I found the light to have a very tight beam; it is excellent for a 200LM light. The product is extremely maneuverable and easy to conceal at a downward angle under my left arm. I currently use the bat light for security work. It is kept in my vehicle and inside the shop dying duty hours. I also use it for outdoor rounds and sometimes in lieu of an expandable baton. My wife also likes the product and has no issues maneuvering the light, although I’m glad to report she has never been forced to use it in a defensive encounter.. She takes the light with her in the early morning (when it is still dark) when walking the dog. The soft touch tip is easy to locate and the light turns on with great ease. Although the unit is sold as a light, there may be issues to consider for Texas residents under TPC 46.01 when brining it to bear as a club. I have a baton certification, so it’s not an issue while on duty, but something to at least keep in the back of your mind if you intend to use the bat light in self defense. Even so, I’d much rather be talking about splitting legal hairs on use of an impact weapon than dealing with the aftermath of a violent attack. The bat light is not sold in CA, IL, KS, MA, MI, NJ, or NY. Advertised price is $39.99. I picked up two units for $27 at a gun show in Mesquite. Amazon has them priced at $29.99 as of the writing of this review. I’ve priced them periodically at Walmart.com and found units available under $25 with pickup at a store nearest to your location. I do not have any idea as to the delivery time frame. So, your options seem to be under $25 and wait for an indeterminate time frame or $30 and wait for Amazon shipping. I can’t guarantee you will find a gun show deal under $30. In summary, I believe the bat light to be a good value for the dollar if you purchase it primarily as a flashlight. Possible use as a defensive weapon is a bonus. The tight-beam light is excellent for temporarily blinding/distracting an attacker and providing an escape opportunity without having to engage with a melee weapon. If you are currently considering a purchase, I hope you found this information helpful.